I always adored movies as a kid – from Dumbo to Mary Poppins (still one of my all-time favs! 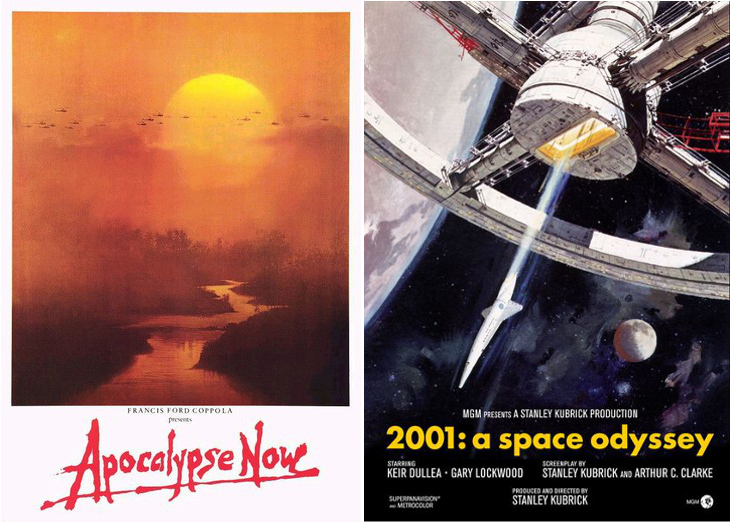 ), from Ferris Bueller to Rocky… but it was seeing Apocalypse Now and 2001: A Space Odyssey in the space of a month when I was 15 years old that changed the way I looked at films forever. My first proper film crushes! To be honest, I didn’t entirely understand either film at the time. When I watched both again a couple of years later they opened themselves up to me (a bit). But at 15… they were beautiful… no, somewhere far beyond beautiful. Poetry on the screen. They were epic in every way. They did more than just go from A to B to C: they communicated some sort of profound meaning and story that I couldn’t quite grasp but that felt really, really important. I think the fact that I felt I was missing something definitely helped me to become completely consumed by them – I mean, we all want to feel as if we’re appreciating something slightly above our heads, right? Especially as teenagers. 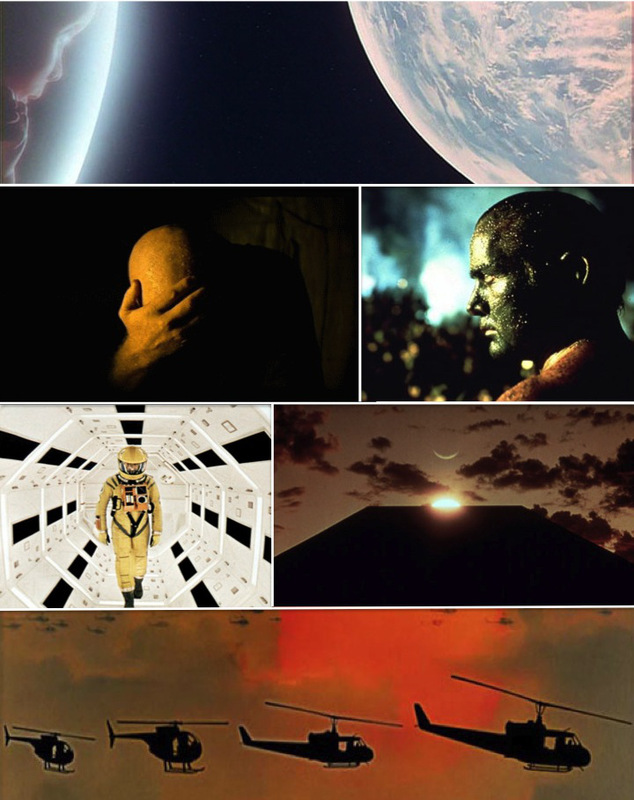 2001 is a story about the evolution of humankind via a black, alien monolith that we are first introduced to at The Dawn of Man, as it’s appearance on earth seems to stimulate apes to use tools and weapons. The rest of the movie essentially follows mankind’s quest to understand it’s own origins and future through a search for the origin of the monolith. It’s gripping and tense and exciting – but rather than creating thrills or relateable characters, it is primarily focussed on being quiet and patient and intent on filling us with wonder. Yeah, wow-erama. Apocalypse Now, set during the Vietnam war (but very far from a typical war film), is about a mission of one soldier (Willard) down a river to hunt down a decorated war hero (Kurtz) who has ‘gone native’ and may have caused horrific atrocities. Behind this framework, it is a story about the reality of war – the horror – not so much about Willard finding Kurtz, but discovering what Kurtz himself discovered. It is dark but beautiful, operatic and horrific, and it reaches in to some very dark places of the human soul. However, it wasn’t just that I was young that made me love these films. The directors, Stanley Kubrick and Francis Ford Coppola, were ahead of the rest of the world with what they were putting on screen. It is genuinely impossible for me to pull out favourite scenes from either film because pretty much every scene in each is a classic. The imagination and the skill required to make art like this is almost beyond my comprehension. Big love. Big, big love for these movies being awesome and showing me the very limits of what cinema can do. I’m not sure that either has ever been matched. This entry was posted in - Stuff that inspires me and tagged 2001, a space odyssey, apocalypse now, brando, fiction, film, film review, films, francis ford coppola, inspiration, kubrick, mary poppins, movie, movie review, movies, sci-fi, science fiction, space, stanley kubrick, stuff that inspires me, vietnam, writing on May 16, 2013 by beautifulorange.